Carolina Mountain Land Conservancy is still hoping for a Christmas present from North Carolina Wildlife Resources Commission. 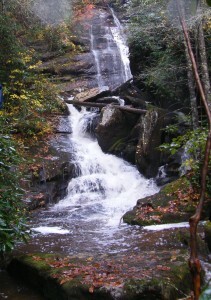 Most folk who follow conservation issues across the region are probably aware that CMLC and their partner The Conservation Fund have a contract with former congressman and Brevard cattle and timber farmer Charles Taylor and his family for the fee-simple acquisition of 8,000 acres of outstanding wilderness in southern Transylvania County known as the East Fork Headwaters. The Conservation Fund is sitting on a $3 million down payment and the Taylor family has agreed to finance the rest of the $33 million price tag. It was widely publicized last week prior to a NCWRC meeting that TCF was not prepared to pay the $3 million unless NCWRC would commit to managing the tract; assist CMLC and TCF in seeking funding and eventually take title of the tract. Many, like me, who read the press release and/or the official resolution passed by NCWRC probably breathed a sigh of relief and felt that the preservation of this large, ecologically sensitive tract was guaranteed. Alas, CMLC is not quite so confident. I received an email from Kieran Roe, executive director of CLMC that stated: “While WRC [NCWRC] has made a partial commitment that the conservation groups have been seeking – they have clearly stated their willingness to serve as long-term land managers, and also to assist with seeking federal conservation funds, they have still not fully committed to partner in seeking state funds for which they are uniquely eligible – specifically NC Natural Heritage Trust Fund. No one but the players know for sure what kind of sticking points are out there in the land of “budget shortfalls.” CMLC believes that public comment in support of the deal has been and will continue to be important. Their website has addresses and suggestions for people who want their voices heard in support of the purchase of this impressive, biologically rich and diverse landscape. I, for one, wish them success.